There’s no denying that food cooked on a charcoal BBQ grill taste delicious. But, for those pizza lovers, you can get tasty wood oven pizza in as little as one minute with the best outdoor wood fired pizza ovens! Furthermore, an outdoor wood fired pizza oven can also be used to cook meat, seafood, vegetables and bread, not just pizza. No worries if you already have a gas barbecue grill, it won’t be a waste as you can also buy a portable BBQ pizza oven to pop on top of your BBQ. 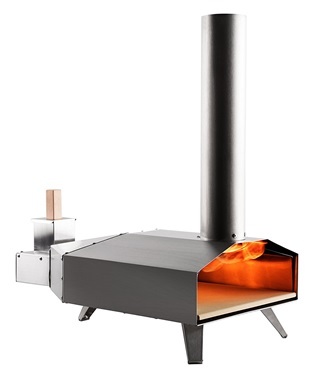 This will convert your BBQ into a BBQ pizza oven, but it won’t be quite the same as an outdoor wood fired pizza oven. Capable of temperatures of up to 500°C. Cooks a pizza in just 60 seconds. Reaches maximum temperature in just 10 minutes. Uses wood pellets which ignites easily. Made from stainless steel which maintains the performance even after years of use. Place on top of any stable surface. 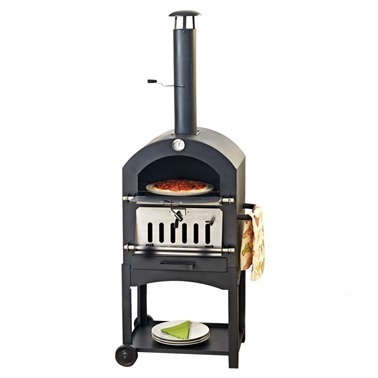 If you’re looking for a portable wood fired pizza oven that takes up little space, then here’s your answer. Measuring at only 64L x 22H x 36W cm (height including chimney 67cm) and weighing only 13.4kg, transporting the Unni 3 Pizza Oven from one place to another is no problem at all. Furthermore, it won’t take up much room in storage either! With the ability to cook pizza’s up to 13” in just 60 seconds, there’s no wonder why this is such a hot seller. Your guests definitely won’t stay hungry for long. Can use wood or charcoal to heat up. Thermometer on the front lets you know when the oven is hot enough to put your food in. Dimensions (cm): 51L x 157H x 38W. Not that good a maintaining high temperatures for long periods. Why not opt for something a bit different to a BBQ, this garden wood fired pizza oven by La Hacienda can cook anything your BBQ can too, plus pizza! Requires 2 people to assemble but should be quite straightforward. Make this stand out anywhere in your garden as it also comes with the neat looking standing, so doesn’t taking up room on your outdoor picnic table. Cooking grill size 34.5 x 24.5cm. Made from solid durable iron. Built-in temperature gauge allows you to monitor your food. Upper chimney for temperature control and oxygen flow. Handy storage shelf at the bottom is perfect for plates, cutlery or food. Easily transport it from one place to another with wheels. Can be difficult to maintain high temperatures. Despite some complaints from users about the inability to maintain high temperatures, the Clifford James Wood Fired Pizza Oven is still a bargain! 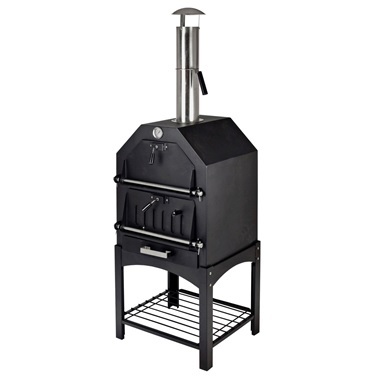 Perfect for anyone who loves a wood fired pizza but also enjoys their charcoal barbecued food. Comes with a 2 year manufacturer’s warranty for peace of mind. Handmade by Mexican artisans from renewable raw materials. Heats up in 15 minutes, can cook pizza in as little as 3 minutes. Place on top of any stable table or surface. Diameter of 52cm and height 44cm. Quite a small opening, so only able to cook a small pizza. 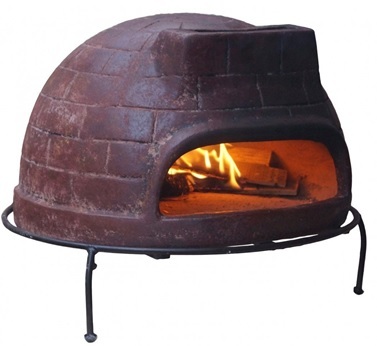 This classic looking outdoor wood fired pizza oven definitely wins with its brick oven look. Performance wise it’s also pretty good, but perhaps only for smaller groups since it can only handy a small pizza at a time. It’s handmade design by Mexican artisans will give your garden an ancient feel. Place on top of charcoal or gas BBQs to convert it into a BBQ pizza oven. Magnetic see-through door allows you to check up on your pizza without letting the heat out. Temperature gauge enables you to monitor the temperature in which your pizza is cooking at. Carry handles for easy transportation. Includes 10mm pizza stone to get more of an authentic feel. Not very secure when placed on top of your BBQ. Already have a BBQ grill you own and love, but you want to try out a wood fired pizza oven. Well, perhaps the Blaze Box BBQ Pizza Oven doesn’t quite have the same elements of a wood fired pizza oven, but it’s somewhere in-between. You won’t get the same wood fired taste, but, you can cook pizza on your grill alongside your other meats! It’s a great addition to your current BBQ without having to fork out loads of money for an outdoor wood fired pizza oven. In addition, it’s portable and doesn’t take up much room in storage either. Since buying a garden wood fired pizza oven has become very affordable, more and more people want one. Selecting the most suitable one for your garden shouldn’t be too difficult for most people. Usually they can come as a standalone unit which includes a neat looking stand, or a table top model which takes up less space in storage. 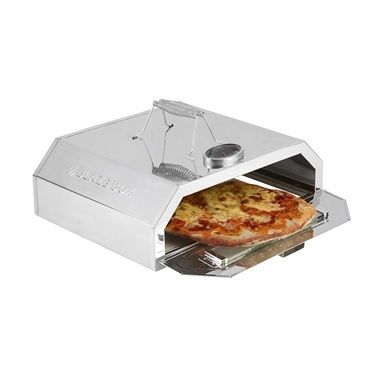 For those diehard pizza lovers, perhaps the Unni 3 Portable Pizza Oven is the best choice for you, as it can could a delicious pizza in just 60 seconds! Anyone who doesn’t already own a BBQ can opt for one that comes with a stand, as they won’t already have a BBQ taking up space when it’s in storage.